Aluina and her granddaughter Alicia hang tarps along the chain link fences of the Pahoa Community Center behind their beds to block out the sulfur dioxide gas in the air. Smoke and fumes forced them out of their homes and now they’re concerned about each breath they take. Like their neighbors, Alicia and Aluina have enough to worry about. After the volcanic eruptions poured lava into their community in Leilani Estates, they took what they could to the Pahoa Community Center, where Aluina works as a security guard. As a staff member and evacuee who is working and living at the shelter, she’s always on watch and looking out for the other residents. 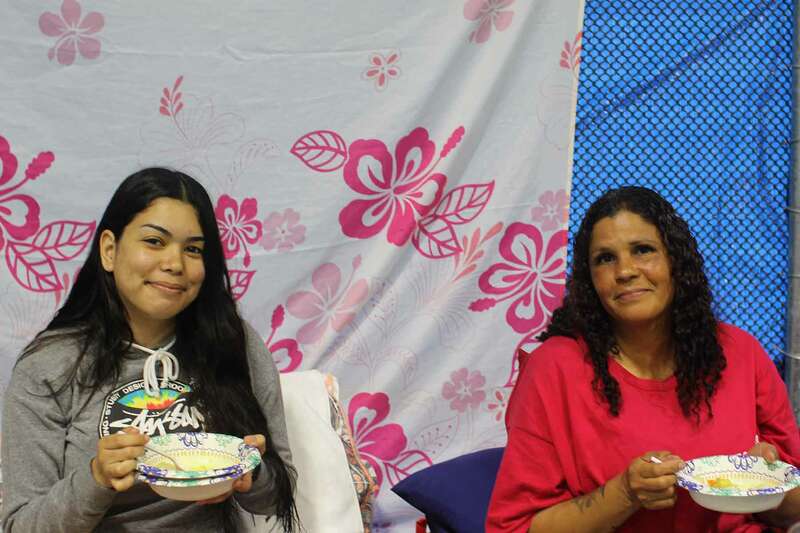 Aluina and Alicia think of the challenges they face in getting through this disaster, but they both keep smiles on their faces as they eat a full plate of rice, curry, salad, and fruit for dinner – taking everything in, one step at a time. The next morning, Aluina is up bright and early for breakfast served by Salvation Army volunteers. Then she takes Alicia to school, and comes back to greet her neighbors as she begins her patrol, knowing there will be lunch ready in a few short hours.